BECAUSE OF LOVE - Volume 1 - performance at The Place, London - 5th March 2013. Franko B makes his debut at The Place with the new multi-disciplinary performance solo, Because of Love volume 1. 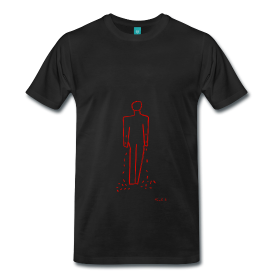 Drawing upon memories of vivid moments and experiences of art, film and dance from different stages in his life, this piece is about life, childhood, humanity, inhumanity, love and grief. Central to the work is the idea of the sentimentality of memory – the emotional charge and romanticism often applied to our experience of remembering culture. Experiences can be mediated by someone else’s voice or appropriated in a way which is both personal and political. 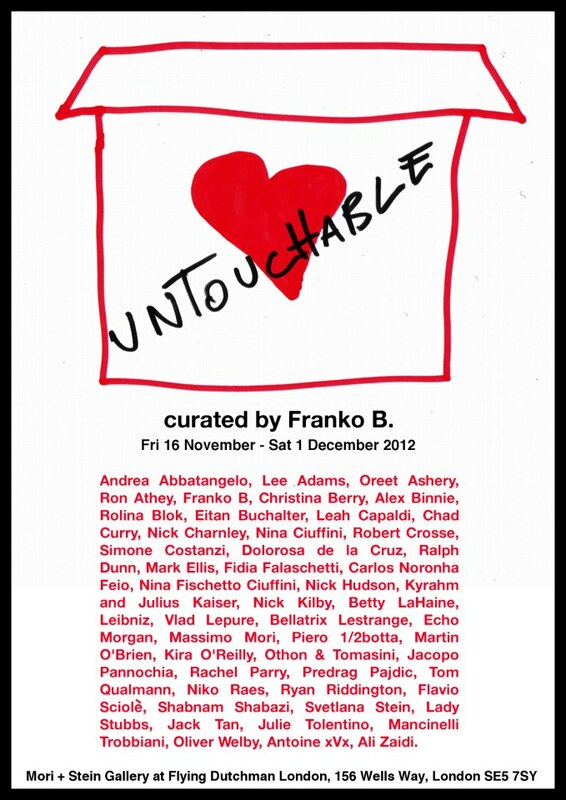 Franko B was born in Milan and has lived in London since 1979. He has exhibited and performed widely, including at Tate Modern, the ICA, South London Gallery and Beaconsfield, and has presented work internationally. For more information about the Because of Love 2013/14 touring programme, visit http://franko-b-because-of-love.blogspot.co.uk. Sat 1st Dec, 5PM-1.30AM (in connection with World AIDS Day) - Discussion, followed by performances and closing party. Franko B DJ and closing party. For more info ask to join the Facebook group. Cick here to read Franko's UNTOUCHABLE interview in the Southwark LGBT Newsletter. 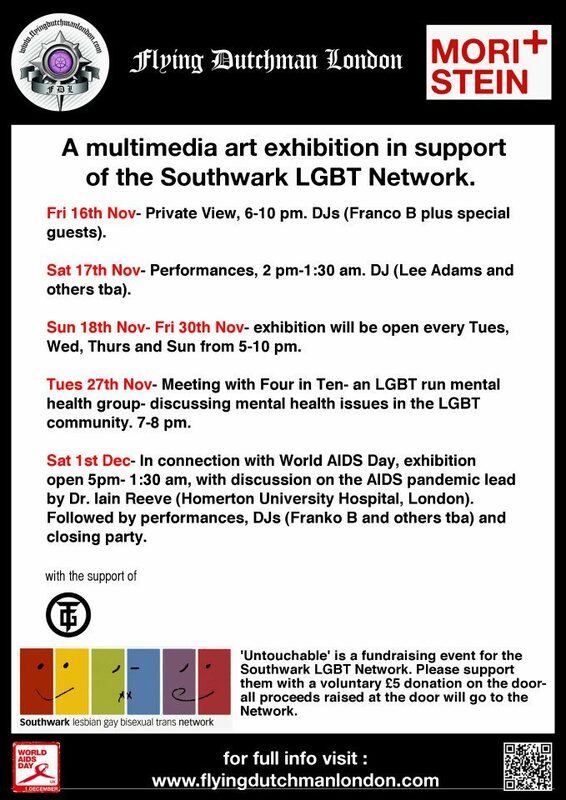 UNTOUCHABLE - A mixed media exhibition in support of the Southwark LGTB Network, Curated by Franko B. 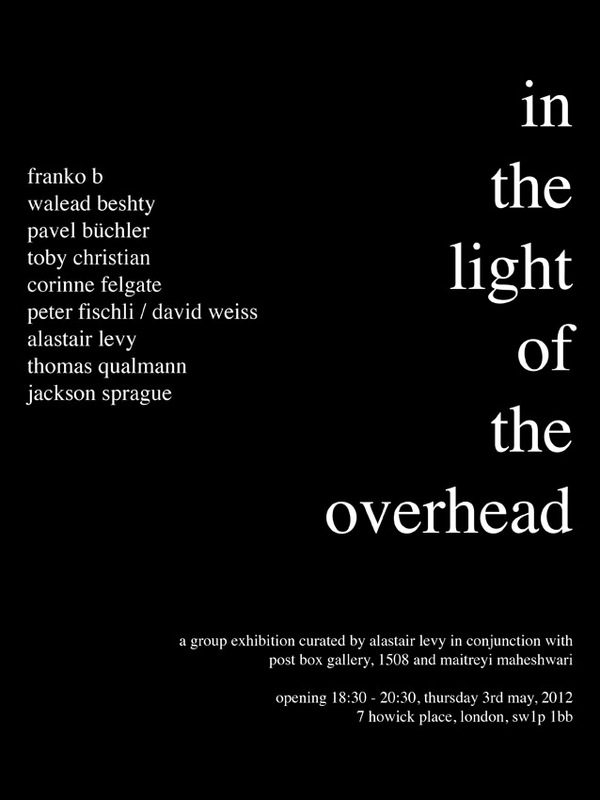 16th Nov - 1st Dec 2012, exhibition open Tues, Wed, Thurs and Sun, 5-10pm. 17th Nov: Performances 2pm - 1.30am. 27th Nov: Meeting with Four in Ten (an LGTB run mental health group). 1st Dec: In connection with World AIDS Day, exhibition opens 5pm - 1.30 am, with a discussion led by Dr Iain Reeve, followed by performances, DJs and closing party. Andrea Abbatangelo, Lee Adams, Oreet Ashery, Ron Athey, Franko B, Christina Berry, Alex Binnie, Rolina Blok, Eitan Buchalter, Leah Capaldi, Chad Curry, Nick Charnley, Nina, Ciuffini, Robert Crosse, Simone Costanzi, Dolorosa de la Cruz, Ralph Dunn, Mark Ellis, Fidia Falaschetti, Carlos Noronha Feio, Nina Fischetto Ciuffini, Nick Hudson, Kyrahm and Julius Kaiser, Nick Kilby, Betty LaHaine, Leibniz, Vlad Lepure, Bellatrix Lestrange, Echo Morgan, Massimo Mori, Piero 1/2botta, Martin O'Brien, Kira O'Reilly, Othon and Tomasini, Jacopo Pannochia, Rachel Parry, Predrag Pajdic, Thomas Qualmann, Niko Raes, Ryan Riddington, Flavio Sciole, Shabnam Shabazi, Svetlana Stein, Lady Stubbs, Jack Tan, Julie Tolentino, Mancinelli Trobbiani, Oliver Welby, Antoine xVx, Ali Zaidi. 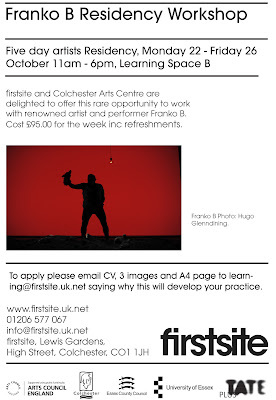 firstsite and Colchester Arts Centre are delighted to offer this rare opportunity to work with renowned artist and performer Franko B. Cost £95.00 for the week inc refreshments. 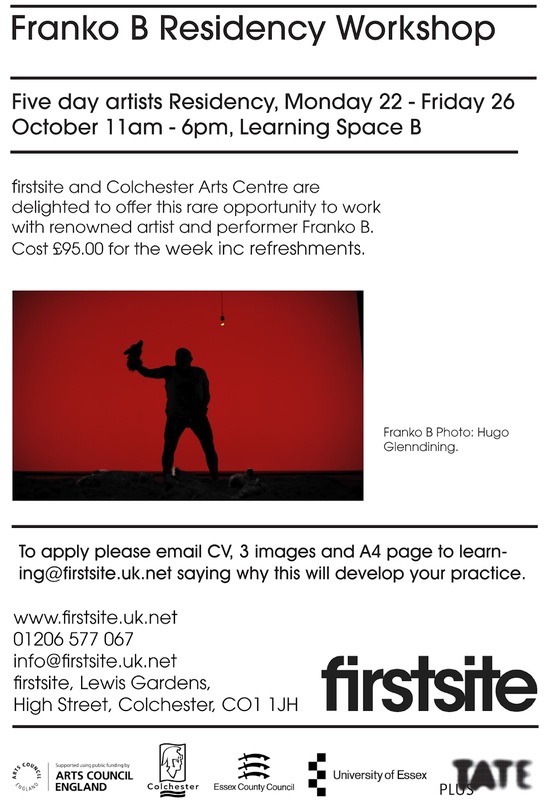 To apply please email CV, 3 images and A4 page to learning@firstsite.uk.net saying why this will develop your practice. performance at SHORT THEATRE, Rome, Italy. Franko B for the first time in Rome. The leading exponent of the scene of the World Body Art will attend the seventh edition of SHORT THEATRE with the performance I'm Thinking of You and with an intense and unmissable workshops that will address the exploration and exposure of themselves as men and women , and as artists, through a work on physical performance, sound and visual art. An excellent opportunity to meet with an artist that has marked the imagination of contemporary art, which for years has been engaged in training courses of performing and visual arts in many schools and universities. A wonderful opportunity to test their boundaries, physical and imaginative. Franko B per la prima volta a Roma. L'esponente di spicco della scena della Body Art mondiale sarà presente alla settima edizione di SHORT THEATRE con la performance I’m Thinking of You e con un intenso e imperdibile workshop che affronterà l'esplorazione e l'esposizione di sé come uomini e donne, e come artisti, attraverso un lavoro sulla performance fisica, sul suono e sull'arte visiva. Un'occasione eccezionale di incontro con un artista che ha segnato l'immaginario dell'arte contemporanea, e che da anni è impegnato in percorsi di formazione di performing e visual art in molte scuole e università internazionali. Un'occasione imperdibile per verificare i propri confini, fisici e immaginifici. BECAUSE OF LOVE - special durational version, 12 pm - 12 am, Friday 5th July 2012. Extracts from Franko B's latest work will be re-presented in a forest setting outside of Verona. April 5, 2012. 7pm - late. Beers.Lambert Contemporary presents the UK book launch of Bruce(X)ploitation, the newest publication by internationally renowned artist Bruce LaBruce. On April 5, 2012, LaBruce and a line-up of his colleagues, friends, and photographic subjects both past and present will be in attendance at London's The Green Carnation bar in the heart of Soho. The event includes a book-signing and brief talk by LaBruce, performances by FrankoB and his band Lullaby for the Abandoned, and up-and-coming band Years&Years, DJ sets by Choronzon and LaBruce himself, and special appearance by cult-celebrity and star of LaBruce's 2010 film LA ZOMBIE Francois Sagat. 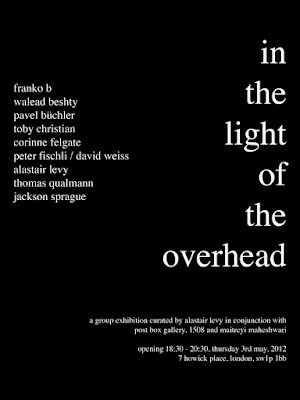 THE FLASH OF NATURE - Group Show at Salone degli Incanti - Trieste, Italy. 12th February - 9th April 2012. Ansel Adams (USA), Allora & Calzadilla (USA / Cuba), Darren Almond (UK), Matteo Attruia (Italia), Carlo Bach (Italia), Olivo Barbieri (Italia), Bill Beckley (USA), Gianni Berengo Gardin (Italia), Primož Bizjak (Slovenia), Gabriele Bonato (Italia), Eelco Brand (Olanda), Piergiorgio Branzi (Italia), Monika Bulaj (Polonia), Luca Campigotto (Italia), Maria Magdalena Campos-Pons (Cuba), Elio Ciol (Italia), Mat Collishaw (UK), Anton Corbijn (Olanda), Giacomo Costa (Italia), Massimo Crivellari (Italia), Amy Cutler (USA), Arnold Mario Dall’O (Italia), Riccarda De Eccher (Italia), Jim Dine (USA), Fulvio Eccardi (Italia / Messico), Gilad Efrat (Israele), Elger Esser (Germania), Manuel Fanni Canelles (Italia), Paul Ferman (Australia), Giorgia Fiorio (Italia), Franco Fontana (Italia), Jernej Forbici (Slovenia), Franko B (Italia / UK), Daniel & Geo Fuchs (Germania), Mario Giacomelli (Italia), Ugo Giletta (Italia), Antonio Girbés (Spagna), Robert Gligorov (Repubblica di Macedonia), Nan Goldin (USA), Paolo Grassino (Italia), Stefano Graziani (Italia), Renato Grome (UK / Australia), Jonathan Guaitamacchi (Italia), Albano Guatti (Italia), Henrik Håkansson (Svezia), Kenro Izu (Giappone), Alfredo Jaar (Cile), Oleg Kulik (Russia), Irene Kung (Germania), Christiane Löhr (Germania), Robert Longo (USA), Urs Lüthi (Svizzera), Angel Marcos (Spagna), Robert Mapplethorpe (USA), Francesca Martinelli (Italia), Masbedo (Italia), Hiroyuki Masuyama (Giappone), Ana Mendieta (Cuba), Michael Najjar (Germania), Julian Opie (UK), Franco Passalacqua (Italia), Cristiano Pintaldi (Italia), Alfredo Pirri (Italia), Marc Quinn (UK), Francesco Radino (Italia), Sergio Ragalzi (Italia), Robert Rauschenberg (USA), Antonio Riello (Italia), Julian Rosefeldt (Germania), James Rosenquist (USA), Ed Ruscha (USA), Sergio Scabar (Italia), Stefano Scheda (Italia), Luigi Serafini (Italia), Andres Serrano (USA), Mario Sillani Djerrahian (Italia), Janez Vlachy (Slovenia), Santiago Ydáñez (Spagna), Andrew Zuckerman (USA). 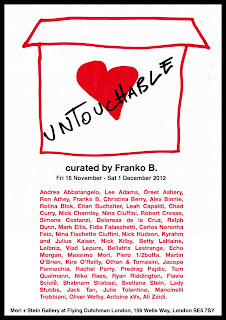 Franko B feature on Art News (Rai Edu) - Broadcast in Italy on 16th December 2011.